You are looking at a bouffant style scrub hat. 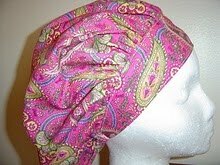 The scrub hat has a wide front band that tapers to the ears for comfort, with adjustable elastic in the back. 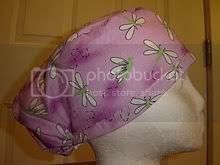 I have sewn a buttonhole into the back hem of the hat and have added a cord lock so your hat is adjustable; you just pull the elastic to make it fit snug or loosen the elastic to make it larger. 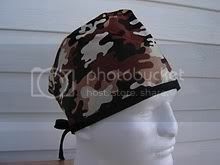 The hat is constructed with reinforced seams and all edges are finished with a serger. The band has a decorative top stitching. 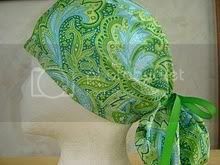 The fabric is a cotton or cotton blend. Some shrinkage may occur. I do not pre wash my fabrics. I recommend washing in cold water and lay flat to dry, or use a dryer on a low setting and remove promptly.